Take your gaming to the next level with our new video game bus. 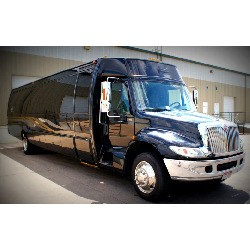 Designed for ages 13 to adult, this luxurious limo style video game bus offers five gaming stations, satellite TV, touch screen audio with pounding sound, unlimited use photo-booth instant 4×6 photo prints. Recessed lighting, hardwood floors and more. The ultimate in video game trucks. Bus comes to you and will remain parked for the duration of your event. We also offer this bus as a party bus that can drive around, pick up and drop off guests, click here for details. Site must be accessible by truck, area must be level. Vehicle will be parked for the entire event.